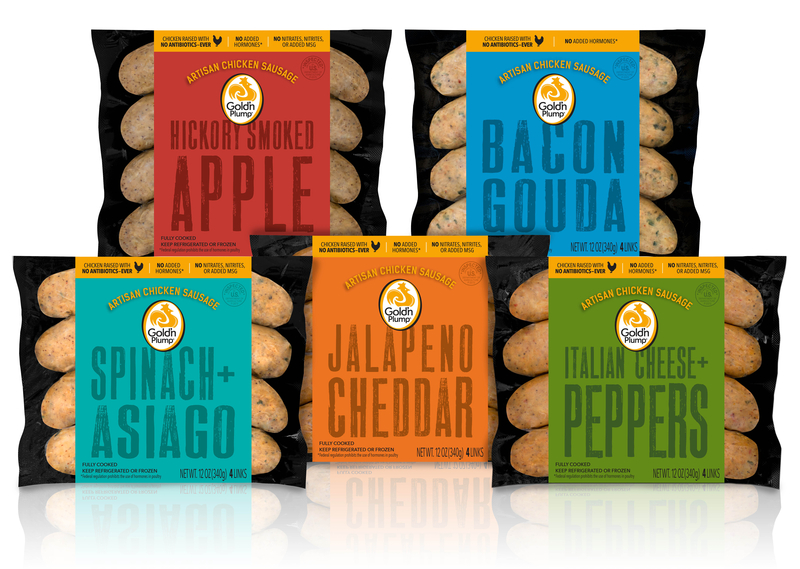 Five artisan sausage flavors from smoky sweet to savory heat available starting late April 2017. St. Cloud, Minn. (March 1, 2017) — Pilgrim’s is launching a line of new chicken sausages under its Gold’n Plump® label—a brand known for making good chicken its mission. The new line packs the goodness of chicken into sausages that are fully cooked and ready to heat on the stovetop or backyard grill for quick, convenient meals. A clean label signifying the sausages are free of monosodium glutamate (MSG), fillers, preservatives, nitrates/nitrites, gluten, and artificial flavors and colors. Gold’n Plump Fully Cooked Chicken Sausages launch at a time when sales of dinner sausages are on the rise. Market research specifically shows that chicken sausage increased 10 percent in dollar sales compared with the previous year. “We are particularly excited that our fully cooked chicken sausages launch in time for backyard barbecues. Grilling enthusiasts will love the convenience of our flavorful line,” added Miller. Chicken is identified as the most attractive segment for the sausages and hot dogs market due to growing health awareness among consumers, according to market research. Packing 13 to 15 grams of high-quality protein per link and up to 73 percent less fat than pork sausages, these new sausages fit the bill for today’s health-conscious, protein-seeking consumers. Vacuum-packed for freshness, each 12-ounce package includes four, three-ounce links. The new sausage line is available for grocers’ refrigerated fully cooked sausage section, and carries a suggested retail price of $5.99 per package. The launch will be supported with recipes and product information on the Gold’n Plump website, and Facebook, Pinterest and Twitter. The product line will also be featured in digital, mobile and radio ads, as well as in-store via point-of-sale shelf-talker materials, product demos, and couponing in select markets.